An alarm went off in the office recently. It took us a while to track down the source. After working silently for the past six years (so much so that we forgot we had it), our APC Smart-UPS 750 began beeping incessantly. The flashing red light on the front panel indicated the battery needed to be replaced. We have a UPS because a power failure or surge/spike can happen any time. Besides the obvious inconvenience of data loss due to an unexpected power interruption, sensitive electronic equipment such as hard drives can suffer irreparable physical damage. In order to mitigate issues from power-related problems, we decided to use a battery backup system, and chose to go the UPS route. The UPS sits between the power from the wall and the equipment to be protected. It acts as a power cleaner (suppress surges/spikes) and a temporary power source to allow a graceful shutdown of equipment should there be an unexpected electrical interruption. The one we have been using for the past six years at the office is the Smart-UPS 750 from APC. 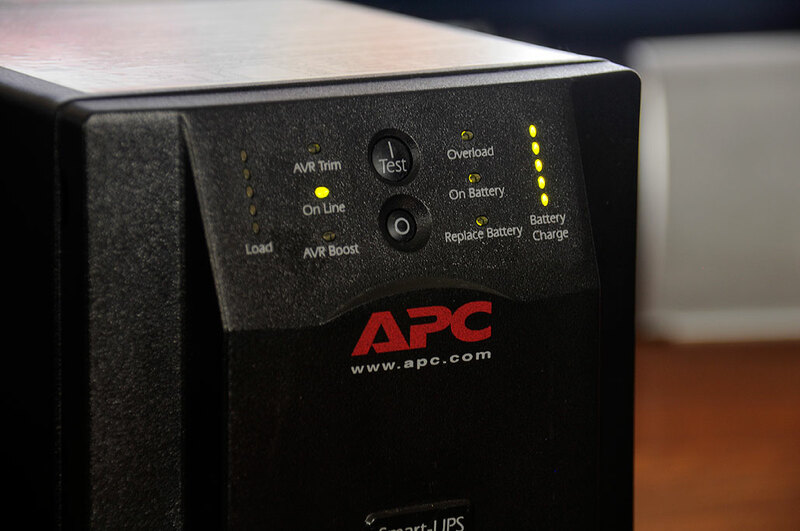 The APC Smart-UPS 750 uses two sealed lead-acid batteries to provide 500 watts of power. For momentary blackouts and glitches, the UPS will automatically kick in fast enough that none of the systems hooked up to it will even flicker. At maximum power draw the Smart-UPS 750 backup will last for five minutes, more than sufficient time for an orderly shut down of any systems we have connected to it. However, as with any battery, the Smart-UPS’s have limited life spans. We were amazed that ours lasted six years! Granted, the power system in New England is pretty reliable, but still…you just need one post-Winter-storm, ice-laden tree to topple and mess you up. What is even more impressive is the simplicity of replacing the Smart-UPS battery. APC designed the unit in such a way that everything can be done without tools (pull down front, pull knobs). To replace the batteries, just open the front panel, pull out the batteries, and unhook the wiring harness. 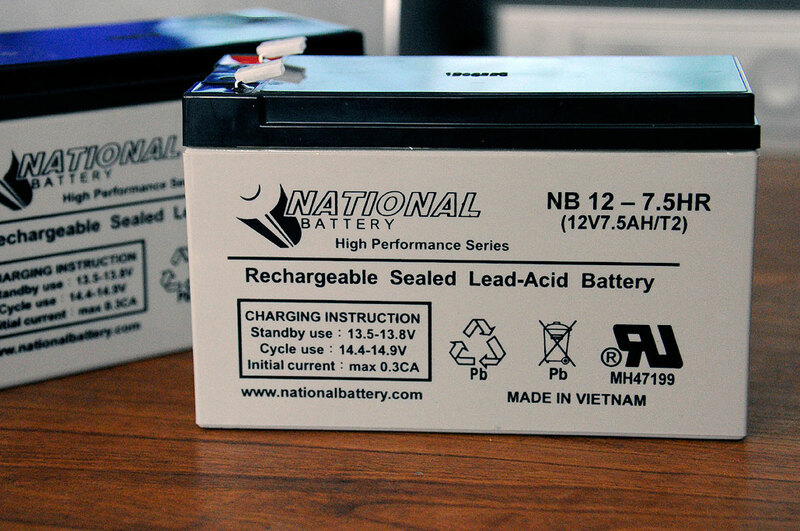 APC does sell replacement batteries, but less expensive options are readily available. We got ours from ReplaceUPSBattery.com; their name pretty much says it all. They had the exact replacement batteries we needed (National Battery, NB12) at a great price w/FREE SHIPPING, and we got them in a few days. Oh yeah, the batteries have the same warranty (2 years) as the OEM ones from APC. How much easier can it be? The only snag we ran into with the battery replacement was that the harness was mounted on the OEM batteries with double-sided tape, so it would have stuck to anything we, uh, stuck it into. We could have forced it, but decided to be safe and remove the tape with the aid of a thin spatula. The same was done with the two clear terminal protectors. The harness is such that when the entire assembly is pushed back into the case, it will be aligned and connect with the control electronics of the Smart-UPS. In less than ten minutes, we were up and charging. Fully charging the new batteries took a few hours, but that is kind of irrelevant as the unit will likely not be called into service during that time 🙂 In any case, it will be interesting to see if this set of batteries lasts as long as the OEM set. Even if it does not, we know where we will be going for its replacement.